Even though hearing loss is the third most common medical condition in the United States, it seems to be one that is most often overlooked, undiagnosed, and undertreated. In part, this is because hearing loss is an invisible condition and its effects often go unnoticed. People tend to make unconscious adjustments to their daily practices and behaviors to accommodate what should be diagnosed as hearing loss. When’s the last time you thought, “Why is this person mumbling? They should speak up!” or “Why does the TV sound like it’s on low volume, even though I’ve got it at maximum volume?” These are common signs of hearing loss, but we do make adjustments to facilitate hearing. We may ask people to repeat themselves or we may think there’s something wrong with the speakers on the TV. A big part of seeking treatment for hearing loss is understanding the realities of the condition. 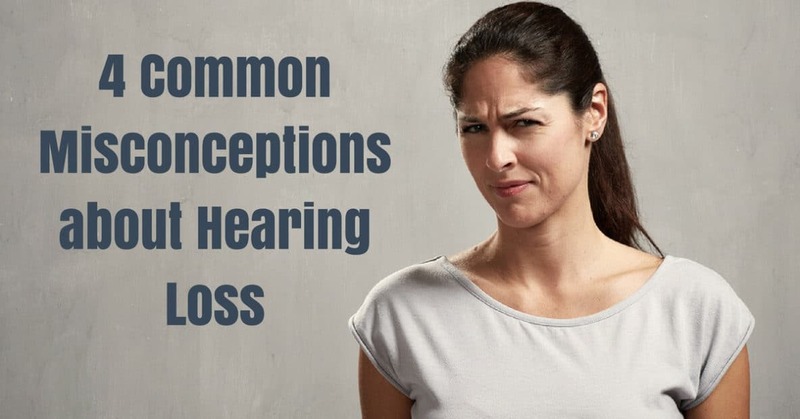 Because there is much weight attached to the topic of hearing loss, we thought we’d clear up a few common misconceptions about the condition. The reality is, hearing loss affects anyone, at any age. In the United States, 48 million people experience hearing loss – that’s about 20% of the population. While it is true that hearing loss does affect a great number of older Americans, it’s not true that it only affects them. One in three people over the age of 65 experience hearing loss, while 50% of people over the age of 75 and 80% of people over the age of 85 experience hearing loss. In many cases, this is due to presbycusis, age-related hearing loss, which occurs with the natural process of aging. However, there are other types of hearing loss as well. Noise-induced hearing loss, a type of sensorineural hearing loss, could affect anyone. Exposure to loud sounds, whether in a one-time event (gunshot, fireworks, explosion, etc.) or over a long period of time (music, occupational hazards, etc. ), could lead to hearing loss in any age group. Younger populations are at risk for hearing loss due to use of earbuds. The position of the earbuds within the ear canals exposes your eardrums to dangerously high levels of sound. Hearing specialists recommend an annual hearing test for people age 50 or older – but it wouldn’t hurt, if you are exposed to loud noise regularly, to take a hearing test. Sure, it is annoying to miss sounds, misunderstand people when they are speaking, and to feel disconnected from your environment. But hearing loss is more than just a mere annoyance that you can fight through if you try hard enough. As a medical condition, the consequences of untreated hearing loss radiate to many different areas of your life. Socially, people with untreated hearing loss begin to withdraw from their friends and loved ones because of difficulties with speech recognition. On the job, people with untreated hearing loss have been found to earn less than their colleagues with normal hearing – and their colleagues who treat hearing loss with the use of hearing aids. In terms of personal safety, untreated hearing loss could put you at risk, whether it’s missing the fire alarm downstairs or not hearing the car honking as you’re crossing the street. Over time, people with untreated hearing loss are at higher risk for developing dementia, as found by studies from Johns Hopkins University. Hearing loss may affect one ear, and this is known as unilateral hearing loss. However, most cases of acquired hearing loss are bilateral, meaning they affect both ears. When your ears pick up sounds from both ears, the audio data is “mixed” in your brain. Your brain actually does the “hearing” – it receives neural signals from inner ear hair cells which it then analyzes and processes as sounds you recognize. Even if you think one ear hears better than the other, it’s important to take a hearing test. Bilateral hearing loss is actually more common, and the best way to find out is to test your hearing and review the results with us at HeaRite Audiological Care. This is perhaps the biggest problem when it comes to hearing loss: people wait an average of seven years from the time they first experience changes in their hearing to the time they decide to seek treatment. Though you may think that you can accommodate your hearing abilities by turning up the volume or positioning yourself with your “good” ear towards a speaker, you are doing more harm than good by waiting. Hearing loss is a progressive condition, and it will gradually worsen over time. However, treating hearing loss as soon as you notice changes is an important step toward better hearing health. When you wait too long, the neural pathways that transmit audio data to your brain may become dull. As such, it will be more difficult to treat your hearing loss and adjust to the use of hearing aids. Our team at HeaRite Audiological Care is here to support you through the journey to better hearing. With a simple hearing test, we can determine whether a hearing loss is present. If one is, we’ll work with you to find the best course of treatment.